Originally named Sandwich Sound by its discoverer, James Cook, the modern Prince William Sound was renamed not for the current prince of the same name, but for the man who would go onto become England’s King William IV. An area almost entirely surrounded by national forest, the ring of the Chugach Mountains stand like silent guardians over this fjord-cut coastal area. Home to a variety of marine life, on this cruise by catamaran into Prince William Sound you will go in search of sea otters, whales and dozens of bird species. Passing through the glacier-filled College and Harrimann Fjords, many will be amazed by the incredible shapes and iridescent colours to be found in this ancient ice. 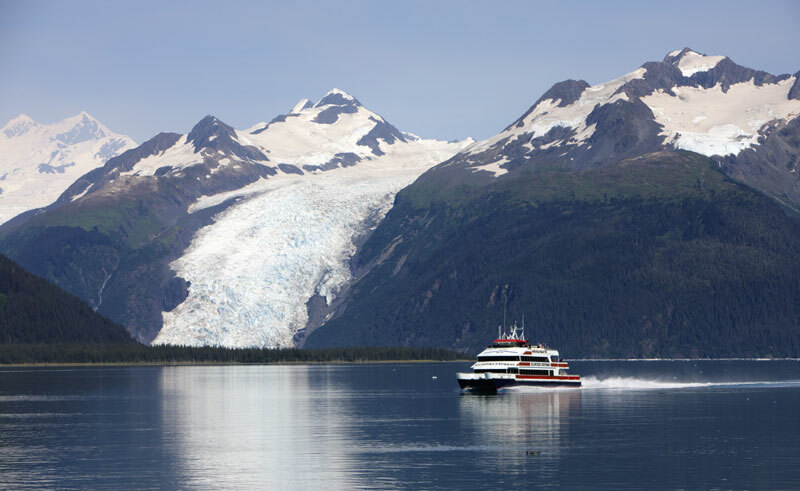 As you head past Alpine, Piedmont and Tidewater glaciers, all eyes on deck will be peeled for the impressive sight of a calving, when glacial ice roars to life and large chunks crash into the water below.